Die Staatsanwaltschaft in New York hatte von der Deutschen Bank Kreditunterlagen von Donald Trump gefordert. Jetzt ist das Institut der Forderung offenbar nachgekommen. Donald Trump zu weiteren Russland-Ermittlungen: "Es reicht"
Acting WH chief of staff reportedly urged top official to not bring up 2020 Russia meddling concerns with Trump. Vor der Zinsentscheidung der türkischen Notenbank steigt in der Türkei die Nervosität. Devisenhändler verkaufen die Landeswährung in großem Stil - und ein US-Ölembargo könnte das Land hart treffen. Donald Trump hetzt mal wieder gegen kritische Medien - seiner Weltsicht zufolge entlarvt der Mueller-Bericht ihre Lügen. Tatsächlich bestätigen die Recherchen des Sonderermittlers die meisten Enthüllungen der vergangenen Jahre. Donald Trump wirft mexikanischen Soldaten vor, gegen Nationalgardisten an der Grenze die "Waffe gezogen" zu haben. Der US-Präsident kündigte eine entschiedene Reaktion an. Drumpf tweeted Wednesday that "Mexico's Soldiers recently pulled guns on our National Guard Soldiers, probably as a diversionary tactic for drug smugglers on the Border," but he didn't support the drug-smuggling claim. Instead of threatening to send additional soldiers along the US-MEX border, he'd better appoint a meeting with Lopez-Obrador to create a mutual plan for the two countries. That's what a rational president would do, he would participate in diplomatic actions. Yet again, we are not dealing with a rational president but with a grown-up crybaby who likes to brag with its uncontrolled power, it's macho-like behaviour. Two U.S. soldiers in a remote area of Texas recently were confronted by Mexican soldiers who thought the Americans had crossed into Mexico. The Mexican troops reportedly removed a weapon from one of the American soldiers. The president tweeted on Wednesday that he is willing to send armed soldiers to the U.S.-Mexico border. 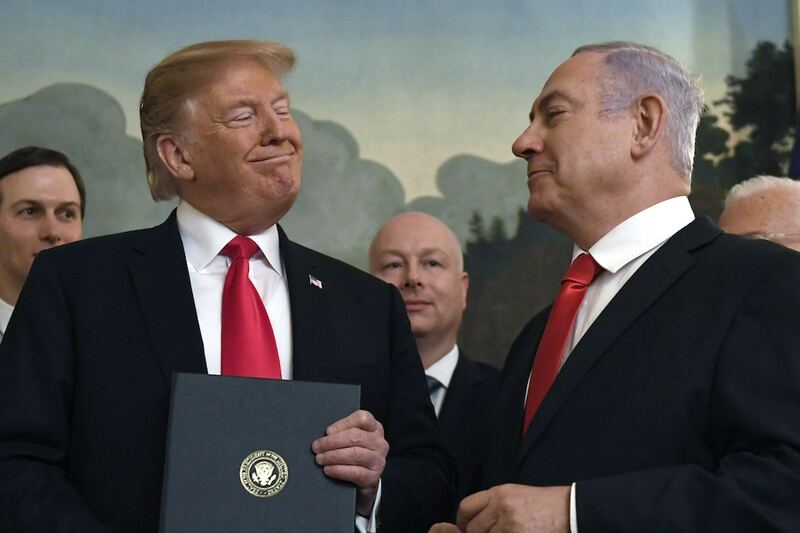 The naked appeal to Drumpf’s vanity — proposing to add his name to the map of the Middle East even as it disappears from apartment buildings in New York — came as Israeli officials expressed alarm that the American president had not yet done enough to sabotage the Iran nuclear deal. Sanders, who would be the first Jewish president of the United States, was asked by a young Jewish activist on Monday during a CNN town hall if his prior criticism of Netanyahu would damage relations with Israel should he be elected. 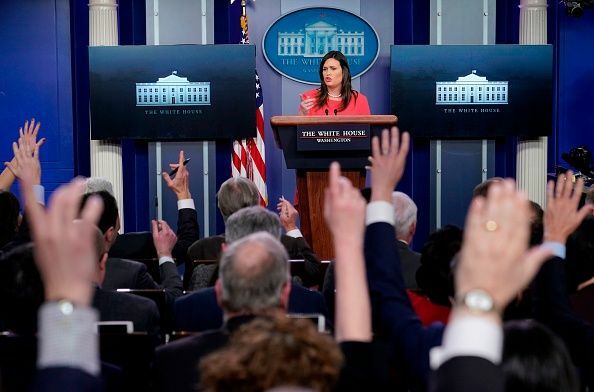 "Presidents have never been ‘immune’ to criticism, regardless of the economy," said Jeremi Suri, a historian at the University of Texas and its Lyndon B. Johnson School of Public Affairs. "From Washington to Drumpf, every president has faced serious criticism from domestic adversaries and various groups. That is as American as apple pie." "There is also the question of who benefits from good economic numbers," he said. "Growing inequality, despite low unemployment, has been a source of criticism for all presidents since at least Nixon." Neal, who had set a 5 p.m. Tuesday deadline for the IRS to turn over the documents, said in a statement that he plans to "consult with counsel about my next steps.” He is likely to subpoena the documents at some point and, given the administration’s resistance to subpoenas issued or threatened by other committees, the dispute is expected to wind up in court. "It's already been litigated in the court of public opinion and in the election. The president won it fairly and squarely," he said. "He's the president, and no one cares about ridiculous charges about tax returns and all types of other things Democrats are doubling down on today." Drumpf is suing House Oversight Chairman Elijah Cummings (D-Md.) to block a subpoena of Drumpf’s financial records from an accounting firm, Mazars USA. Cummings wants the bank records to investigate allegations that Drumpf falsely inflated and deflated asset values to benefit himself, but the president’s lawyers have said House Democrats are abusing their power to try to embarrass Drumpf. 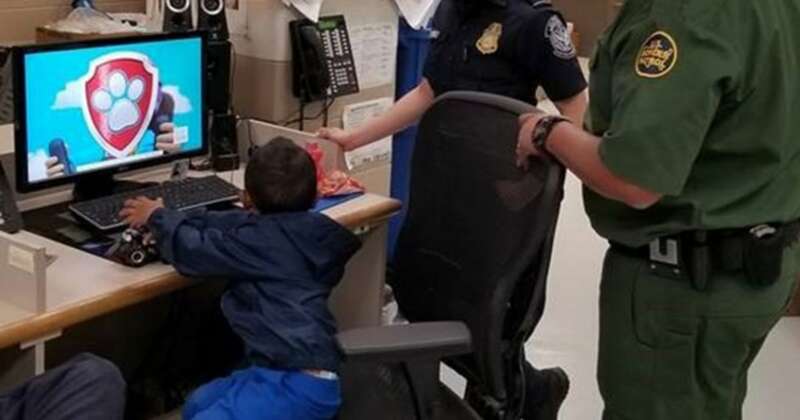 The agents have taken the boy to a U.S. border station and are attempting to find his parents using the number on his shoes, the officials said. So far, they have been unsuccessful and are in the process of transferring the boy to the care of Health and Human Services. The incident marks a flashpoint in the rising number of families and children crossing the border in recent months. In March, a total of 8,975 children traveling without their parents, but most often in groups, were apprehended at the southern border. The number of families crossing has also climbed, with 53,077 parents and children crossing the border together last month. The journey into the Rio Grande Valley of Texas has long been an arduous but popular one, with immigrants risking dangerous waters to float or swim across the river from Mexico to Texas. But the president is having none of it. Though Drumpf himself has spurned the annual White House Correspondents’ dinner for the past two years, he’s taking it a step further, ordering administration officials to boycott the dinner, according to two White House officials. Dozens of administration officials have attended the dinner in previous years, but many will be sending rented tuxes and gowns back without wear this year. The president, who has derided the event as “so boring and negative,” has for the past two years used the evening instead to hold a political rally, where he has railed against the news media. He is set to do so again this year in Green Bay, Wisc. The prolonged silence has come amid a particularly chaotic time for the Drumpf administration following the release of special counsel Robert Mueller’s redacted report on the Russia investigation. While it cleared the Drumpf campaign of conspiring with Russia, the 448-page document exposed not only presidential misconduct but also a hotbed of conflict within the White House, where aides routinely ignored the president’s demands. On Monday, Morning Joe host Mika Brzezinski suggested that media outlets should boycott White House aides “who repeatedly lie.” In late 2018, after CNN’s Jim Acosta had his press pass temporarily revoked, the issue of whether reporters should abstain from pool sprays or press conferences became a major subject of debate. “The press needs to understand that the old rules don't apply anymore,” New York University professor Tad Devine told Newsweek. ... To which Donald Trump contributes the most via his witty tweets which keep us informed about his honorary and worthwhile work. Dorsey tweeted at Drumpf thanking him for the conversation. “Twitter is here to serve the entire public conversation, and we intend to make it healthier and more civil,” Dorsey wrote. “Thanks for the discussion about that.” The Washington Post reports Drumpf complained that the company unjustly “limited or removed some of his followers” in his session with the Twitter CEO. In fact, Drumpf was just tweeting about that earlier in the day. Can't he understand that Twitter usually removes bots and dead accounts? Because at least the first one is the group his fellowship consists of the most. US-Präsident Trump lud den Twitter-Gründer ins Weiße Haus ein, um sich über die Diskussionskultur auf seiner liebsten Online-Plattform zu unterhalten. Zuvor warf er dem Unternehmen Diskriminierung vor. Courtâ€™s conservative majority appears ready to okay question - a move rights groups say would result in an undercount. Court’s conservative majority appears ready to okay question - a move rights groups say would result in an undercount. Der Umsatz steigt, die Gewinne noch deutlich stärker: Nach guten Quartalszahlen liegt die Twitter-Aktie deutlich im Plus. US-Präsident und Dauernutzer Donald Trump erneuert jedoch seine Kritik am Kurznachrichtendienst. Die Geschäfte von Harley-Davidson laufen schlecht, was auch an europäischen Strafzöllen liegt. US-Präsident Donald Trump droht der EU mit einem Gegenschlag. Doch der Handelsstreit ist nicht das einzige Problem des Motorradherstellers. US-Präsident Donald Trump kommt Anfang Juni nach Großbritannien und Frankreich. In London wird mit massiven Protesten gerechnet. Previous to his visit, I would like to demand every member of his administration to be briefed on what has happened during D-Day, so that we can avoid the fauxpas that we were sadly to experience the year before. We don't need any further exhibition of his administration's incapability to recall historic events of this expense. Thanks a lot! “President Donald J. Drumpf and First Lady Melania Drumpf accepted the invitation of Her Royal Majesty Queen Elizabeth II to visit the United Kingdom from June 3 to 5, 2019,” a statement said. “This state visit will reaffirm the steadfast and special relationship between the United States and the United Kingdom. Drumpf will also participate in a bilateral meeting with Prime Minister Theresa May and attend a ceremony in Portsmouth to mark the 75th anniversary of D-Day, before traveling to France on June 6, to participate in a ceremony at the Normandy American Cemetery and meet with French President Emmanuel Macron. This surely is going to be an exciting encounter again, I'm looking forward to following the live coverage. Drumpf has had a somewhat rocky relationship with both May and Macron. While his relationship with May has largely been positive, he has also publicly criticized her handling of Britain’s departure from the European Union. I would rather say that he was threatening the English administration that if they didn't get their exit done, he would break up any relationship with this country. More or less, this was what he said. I may be mistaken, although I hardly believe that. The visit by Trump and his wife Melania will take place from June 3-5, Buckingham Palace said. 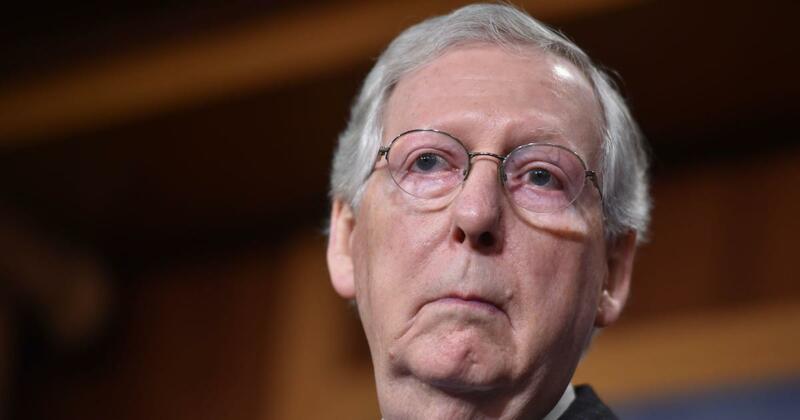 "If I'm still the majority leader of the Senate after next year, none of those things are going to pass the Senate," the Kentucky Republican told a small crowd during an event in his home state Monday. "They won't even be voted on. So think of me as the grim reaper: the guy who is going to make sure that socialism doesn't land on the president's desk." McConnell said progressive platforms are being touted by most mainstream Democrats, not just "some young woman from New York who just got elected to Congress," presumably referring to freshman Rep. Alexandria Ocasio-Cortez, who represents parts of Queens and the Bronx. 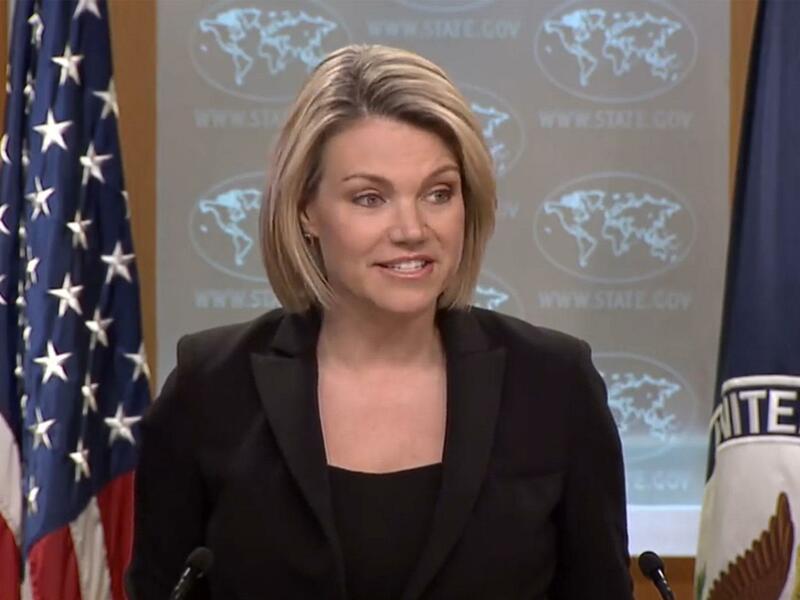 The president signed a memorandum ordering the secretary of state and the secretary of homeland security to submit plans within four months to crack down on overstays, such as punishing countries whose citizens have high rates of overstays and requiring foreign travelers to post "admission bonds" that would be repaid once they leave the country. Members of both parties have long complained that overstays are just as problematic as undocumented immigrants who cross the southern border. More than 1.2 million foreigners overstayed their visas from 2016 to 2017, according to the most recent Homeland Security data. And with illegal immigration remaining at historic lows, that means the majority of new undocumented immigrants are legally entering through land, air and sea ports with visas in hand. So to say, the main problem are not those who entered the country illegally but those who entered the country legally through border checkpoints with valid visas to stay temporarily, but not leaving after their visas have expired. Clearly, a wall would help. NOT. Of course this crackdown could help getting rid of those who didn't prolong their visas, but I would rather ask myself what is the reason why they entered, and why they weren't able to legally demand a longer stay in the US. Pelosi says while Democrats' views range from investigations to impeachment, 'we all agree we should find truth'.